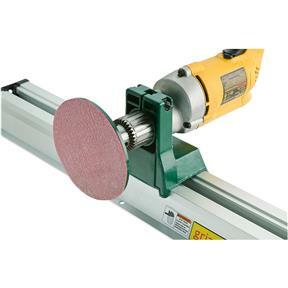 Mount your electric drill in this Hobby Lathe/Disc Sander and you'll have the ability to turn small items, such as pens, and then sand them to completion! 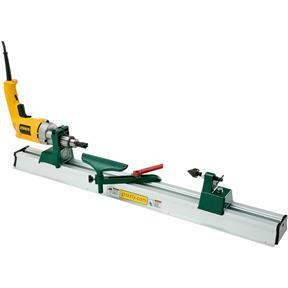 Includes a spur center, screw center, tailstock, and toolrest for wood turning. For disc sanding, includes a 5" sanding disc that mounts in the drill chuck and a sanding table that mounts in the toolrest holder. Sanding disc uses any 5" PSA sandpaper discs. 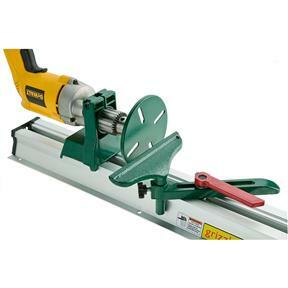 Electric drill and 5" PSA sanding discs not included. Requires drill with 44mm collar size. Approximate shipping weight: 10 lbs. We did not use this for its intended purpose. We mounted a 1/2 HP motor on it and made a shaft for 2 re-loadable flap wheels. Fit our needs for modification. Knowing how to misuse tools is everything! Shipping time was fantastic, I could hardly believe has fast the shipping was. There was a small amount of damage to the box it was shipped in, but there was NO damage to the product itself. I was hoping that my old 1/2 in drill would fit, but could only get a 3/8 drill to fit into the bracket. I had a Oak chunk of wood that would fit perfectly, so U tried turning it into a more round piece and it worked great. I love it. Thank you, the service was excellent, but the quality of the material product was not as what i expected. Poor steel whit no resistance. but for small jobs it can do,,,,! I bought this little lathe to make a few small spindles. I have three different electric drills, a Ryobi and two different Hitachi drills none of which were able to fit properly in the tool with the adaptor provided. Seems to me that at least two slightly different size adapters might be useful. Once I did get it functioning properly by kinda messing up one of the drills chuck, it performed "adequately" at best. With the paint on the tool rest, it simply would not fit in tool rest holder without scraping off all the paint from the rest itself.Not sure I'd call it a "Hobby" lathe, it more like one step above a toy lathe. This being said, I suppose for the low cost, I got what I paid for, since I didn't pay much. 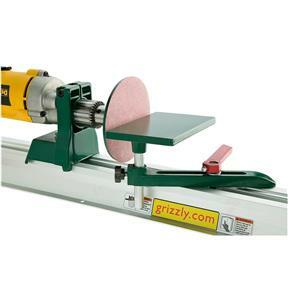 I'd love to see a grizzly lathe in the 150 dollar range, even if it was this lathe, but with a small motor and a bit more attention paid to fit and finish. This order was to rep;ace a unit damaged in transit. GI warehouse was very prompt sending the replacement unit when I notified them of the problem. Great job. I have used the sanding attachment. Areal time saver. The service replacing the unit that was damaged in transit was outstanding. The new sander/lathe performs as expected. GOOD JOB.